Stuctural formula of hydrogen peroxide. H is hydrogen and O is oxygen. The lines repsent the chemical bonds between the atoms. A picture to show simply how the atoms may fill space. 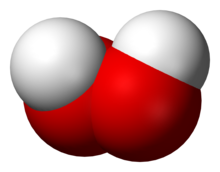 The white is hydrogen and the red is oxygen. Hydrogen peroxide is a chemical compound. Its molecular formula is H2O2. It is used as a cleaner, and as hair bleach. In a concentration of 3% (meaning that there are 3 grams of hydrogen peroxide for 100 grams of a water solution), it can be used to treat wounds. Over time it will slowly become oxygen gas and water through decomposition. Chemists often use hydrogen peroxide in chemical reactions. It is a very strong oxidising agent when used with acid and water. Oxidising agents take electrons from other compounds. Here hydrogen peroxide takes an electron from the Fe2+ ions and becomes water. It can also be a reducing agent when used with other compounds. When it acts as a reducing agent, oxygen gas is also produced. Reducing agents give electrons to other compounds. This method is often used to make oxygen in laboratories. Hydrogen peroxide can be bought in shops when mixed with lots of water but is very dangerous when the concentration is higher. It is flammable and causes burns. This page was last changed on 15 November 2016, at 20:18.